The oil futures market is one of the most significant world markets. The instrument volatility is explained by many influence factors – politics, industrial growth, ecology and others. The news analysis would, most probably, lead a beginner trader astray. 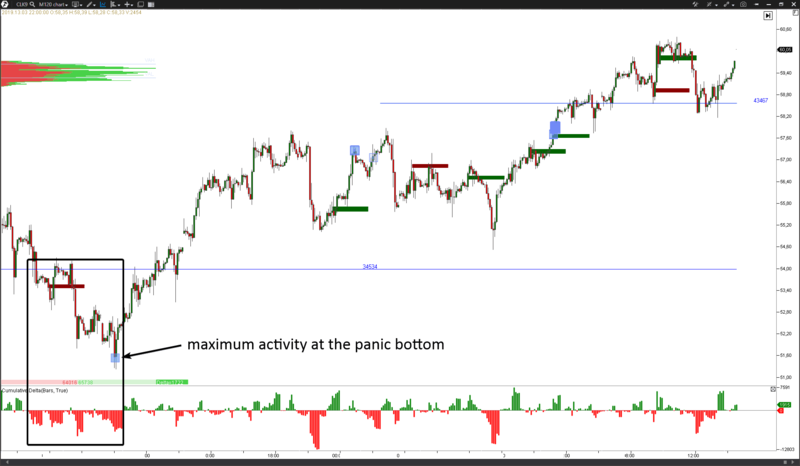 What to do if you do not want to lose an opportunity and it is not possible to go deep into nuances of price formation factors in the oil market? Let the market speak for itself. Let us assess messages of buyers and sellers, which they make during trading sessions. We have a WTI oil futures chart; ticker – CLK9, period – 2 hours. Blue rectangles mark the clusters with big volume. It is an indication of high market activity, which we want to interpret. Red-green waves under the chart is a cumulative delta indicator. This algorithm sums up the volume on ascending and descending moves (waves). Accumulation of red-green lines in the candle chart is a manifestation of imbalance of buyers and sellers, registered in the market (how to trade imbalances). The market depth (accumulation of current asks and bids) is in the top left part. It is not used for the current analysis, but useful when looking for the market entry points. What analysis could be conducted using the chart data? Let us study the background. The market was in the upward trend starting from the middle of February and the oil price quote grew from the low of about USD 51.50 per contract to the current level of nearly USD 60 per contract. In fact, the growth was about 15%. What was the driver of this rally? Note multiple sells, which can be seen on the cumulative delta indicator (marked with a black rectangle in the chart). There were intensive sells on February 5, 6, 7 and 11 – 4 massive waves in total. Then an upward surge took place on February 12. The price, practically, completely levelled out the previous efforts of sellers. How’s that? It means that a major player secretly accumulated a position putting grids of limit buy orders during downward movement. He acts this way accumulating a long position before the ascending trend, which lasts till now. Let us consider more recent data. A bullish breakout of the level of USD 57.50 per contract was done on March 13. Blue rectangles in the chart show activity of traders. The Cluster Delta indicator performs this visualization. 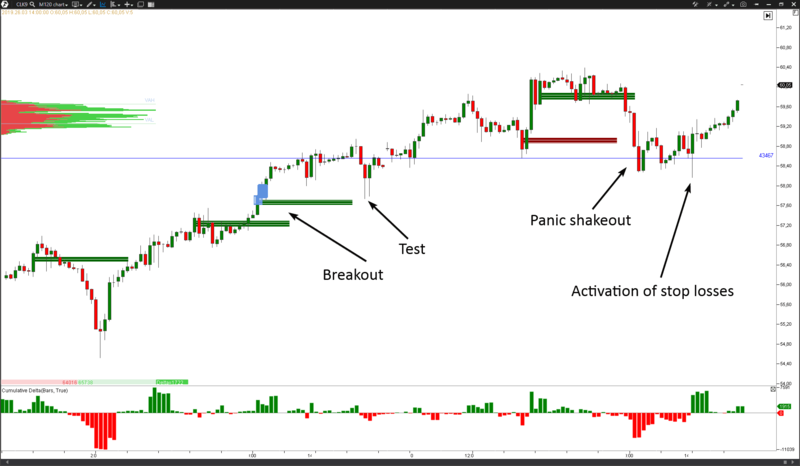 This activity of traders reflects, most probably, engulfing of supply during a breakout to the new peak. Green lines show imbalance of buyers at that moment, which testifies to the fact that this level, perhaps, will support the level in future. A successful support testing took place on March 15 and the price continued ascending progress. High activity around the level of USD 60 during the recent days points to the level of massive resistance near a round psychological level. Green imbalances testify to a false support for “late bulls”, leading them into a trap, which shut on March 22. Will the buyers try to break this level? The most recent actions say “probably, yes”. Why? Note the action on March 22. Most probably, it was an artificial panic, created in order to reduce the number of offers around the level of USD 60 per contract. On March 25, the cunning market activated stop losses of buyers, which were posted at the low of March 22 and moved upward. Both actions could be interpreted as a preparation for the second effort to break the level of USD 60. It is difficult to say whether this buying would be successful, but the situation looks like the buyers are determined to start storming the peak. Gold price analysis with the help of indicators for volume analysis. Natural gas price dynamics. Chart. Analysis.